October 15, 2018– It has been seven months of a new life for two lions after experiencing the horrors of war. Simba was rescued from a zoo in Mosul, Iraq, while Saeed came from an amusement part in Aleppo, Syria. 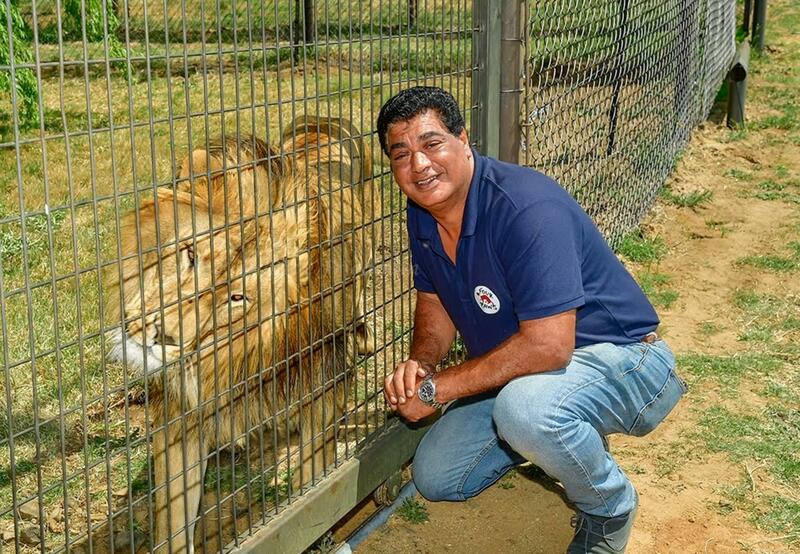 The two lions have been transported to a sanctuary in South Africa, where the man who saved them, Dr. Amir Khalil, has come to check on their progress. At LIONSROCK Big Cat Sanctuary and Lodge, a project of FOUR PAWS International, the two male lions have found peace and refuge in the park that encompasses a total of 3,000 acres. With large enclosures, enrichment programs and state-of-the-art veterinary facilities, the futures of these lions are much brighter than their past. In July 2017, Saeed was rescued in a group of 13 other animals. FOUR PAWS rescued the remaining animals from the neglected zoo at the Magic World amusement park near Aleppo, Syria. Because of his young age, it is believed that two-year-old lion Saeed was born in captivity during the war in Syria. International security companies and the Turkish Ministry of Forestry and Water Affairs supported FOUR PAWS in this life saving evacuation. After being held for two-weeks at the Turkish border, the Turkish government approved the departure of the 13 injured and traumatized animals to Jordan. After more than half a year of rehabilitation in the Jordanian wildlife rescue center Al Ma'wa for Nature and Wildlife., Simba and Saeed were ready for their final journey. The 33-hour transfer took place by passenger planes and trucks. FOUR PAWS Big Cat Sanctuary LIONSROCK, a project by FOUR PAWS, provides an appropriate, lifelong home for over 100 big cats that were kept in inadequate conditions in zoos, circuses or private captivity. The facility, founded for the big cats in 2007 in South Africa (Free State province, 18 km from the town of Bethlehem) offers the highest standards, including large areas for family groups; facilitation of natural behavior through enrichment; and the highest standards of medical care and enclosures. In LIONSROCK hunting, trading or breeding of big cats is strictly prohibited. The park encompasses a total area of approximately 3,000 acres. The enclosures for the big cats cover an area of 60 hectares. In the rest of the park, other typical South African species live freely (e.g. zebras, wildebeests and other antelopes, etc. ).